Debris from damaged structures at Jojutla, a town in the state of Morelos near the epicenter. Most structures in town suffered extensive or complete damage. Photo credits: Pedro Arduino and Jake Dafni. Although rubble and cracks in buildings may not have tangible value, they provide priceless information to the research community. By analyzing damaged infrastructure in the wake of natural disasters, researchers gain insight that helps inform the development of more resilient communities. 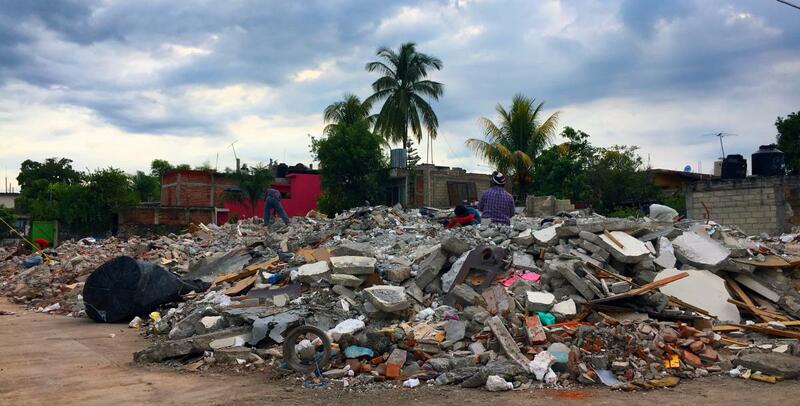 In the aftermath of the 7.1 magnitude Central Mexico earthquake in September 2017, which killed more than 350 people and collapsed numerous buildings, a reconnaissance team traveled to Mexico to collect perishable data. Unlike other forms of data, perishable data must be gathered quickly before it is no longer useful. The 12-member team included CEE professor Pedro Arduino and alumnus Jake Dafni (Ph.D. ’17), who is the site operations manager for the CEE department’s natural hazards research center. The team was organized by the NSF-funded Geotechnical Extreme Events Reconnaissance (GEER) Association. Following a major disaster event, GEER contacts volunteers and quickly assembles reconnaissance teams comprised of researchers from academia, industry and other organizations. The volunteers arrived on site in Mexico two weeks after the earthquake. Professor Pedro Arduino stands near a landslide caused by the earthquake. Alumnus and site manager for the department’s natural hazards research center, Jake Dafni and fellow GEER team member Eric Lo, a drone pilot, stand in front of a damaged roadway and bridge over the Yautepec River in Mexico. With the goal of both better understanding what happened during the earthquake and paving the way for enhanced resiliency, the reconnaissance team collected as much perishable data as possible during their week-long mission. A typical day started at 6am, when the team members gathered to discuss plans for the day and divided into smaller 2-4 person teams. They relied on students from the local university, Universidad Nacional Autónoma de México, to serve as translators and help them move around Mexico City and the surrounding area. 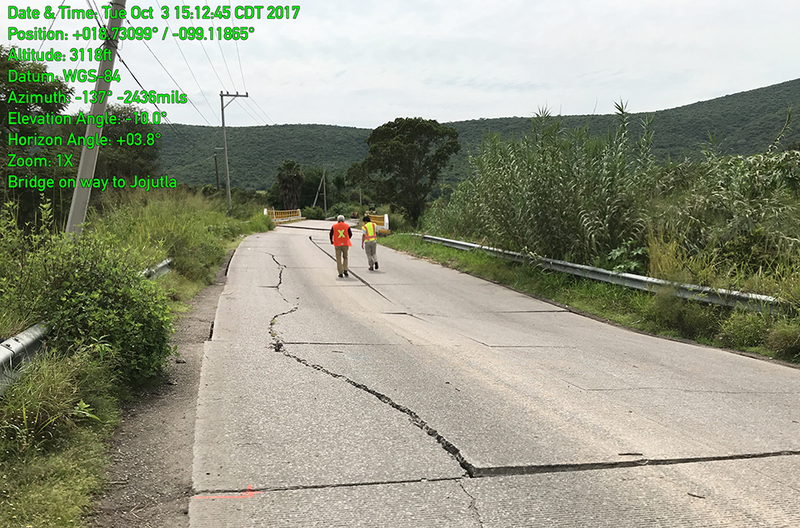 At each site they visited, the team took photos and measurements of damage to buildings, bridges, roadways and utilities, as well as ground deformations and landslides. In areas that experienced greater damage, they used drones and scanners to gather data, which will be used to create 3-D models. Collapsed dome of the San Juan de Dios church in Izúcar de Matamoros. The church was constructed in the 1400s. Many of the research team's photos contain green text with GPS data and other information. As Mexico City is one of the most seismically active areas in the world, the researchers also collected seismic data to analyze how the ground may respond in future earthquakes. When compared to current design standards, the data can be used to inform improvements to design criteria. For example, following the 1985 and 1999 earthquakes in Mexico, building design codes were updated. However, many older buildings have not been brought up to code, making them vulnerable. Some buildings were also vulnerable due to their age, as well as simply from the strong motion caused by the earthquake. The majority of damaged structures were two- and three-story concrete moment-frame buildings with masonry infill, which are common in South America. This type of building construction is known to be problematic if not properly designed. “It is difficult to retrofit every building in a city that is almost 500 years old and contains many fragile structures,” Arduino said. In the days following the earthquake, the researchers saw first-hand that many structures were not properly repaired. Damaged factory floor in southeast Mexico City. In the background, professor Pedro Arduino (right) talks with the factory owner. GEER team member Menzer Pehlivan stands in front of a condemned building and rotated wall caused by differential settlement of the earth. By evaluating which structures survived and which ones suffered damage, researchers hope to improve construction methods and engineering designs. “Assessing the performance of the earth and infrastructure subjected to extreme loading allows us as engineers to directly observe and analyze where our engineering designs have succeeded, struggled or failed,” Dafni said. To share their findings with the greater engineering community, the reconnaissance team is preparing a final report that will be publically available. This was Dafni’s first time participating in an earthquake reconnaissance mission. His decision to join the team stemmed from his new position as the site operations manager for the CEE department’s Natural Hazard Engineering Research Infrastructure (NHERI) Rapid Experimental Facility. Starting in autumn 2018, the center will headquarter the collection, assessment and archiving of high-quality data in the aftermath of natural disasters. In preparation for the center’s launch, Dafni was interested in seeing first-hand what types of challenges exist for natural hazards engineers during reconnaissance missions, such as the ability to rapidly collect quality data throughout a large region. Dafni hopes to overcome such challenges by introducing new technology, training and other practices. Inspecting a bridge over the Yautepec River on the way to Jojulta are professor Pedro Arduino and GEER team member Eric Lo, from left.